A team from the NDB Head Office consisting of the Leasing, Internal Audit, IT, Digital Financial Services, OCMD, Network Management and Shared Services Departments volunteered to improve the infrastructure of the school. The team assisted in improving the infrastructure of this school, including the renovation of the existing toilets, setting up a library with over 1500 books, upgrading classrooms and donating sports equipment. Additionally, NDB volunteers also conducted a variety of motivational workshops for the students, the school faculty and parents followed by an art competition. 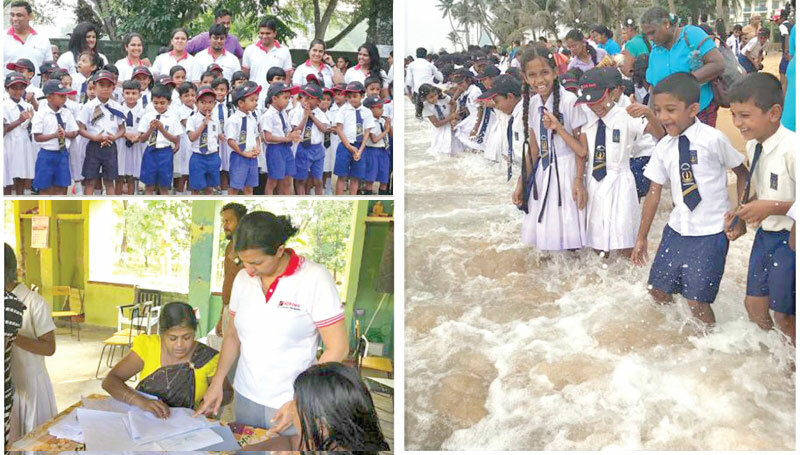 However, the highlight of the project for the students was when the Bank volunteers organized a visit to Colombo which included a visit to the Planetarium, Colombo City Tour (including the prominent places such as the Museum and Nelum Pokuna), a Train trip from Fort to Wellawatte and the Wellawatte Beach. NDB commenced the “Employee Volunteerism” CSR Initiative in 2009. As a responsible corporate citizen, NDB believes that ‘Community Involvement’ goes beyond core business activities and with an objective of creating value through employee participation, the Bank encourages its employees to volunteer their time and effort to give back to the community. Employee volunteering programs can allow workers to feel that the work they do is not only contributing to the overall success of the company, but that it is also helping out a charitable cause that is important to them. Whilst, inculcating responsibility towards the Community and Environment in all NDB employees, this initiative also motivates them to venture out on their own and implement their own projects.